Robert, 88 years old, lives with his adult children in Hackensack, Bergen County, whom are in their 50’s. Robert was a child growing up just after the Great Depression, so he is afraid of banks and risky investments. His don’t understand him and his fears. They are underachievers and unmotivated in work and in life. Every day, Robert gets called a “silly old man” and “a dinosaur” by those around him. Robert is also called names by his grandchildren. He is blamed for everything that goes wrong in the house. This constant taunting, insults and name calling makes Robert depressed, which is often confused with sadness by those around him. Robert does not know that he is being abused, but he feels sad most days. Robert is a victim of elder emotional abuse for being constantly insulted. Mary, 78 years old, lives with her grandchildren in Newark whom are in their late 20’s because she is unable to take care of herself. She pays her grandchildren to take care of her from her retirement savings. However, her grandchildren are facing money problems as a result of over-spending. Mary receives a check from social security each month. Whenever she receives this check, her grandchildren force her to sign it through coercion, and they take it to the bank and cash it for their benefit, leaving little left over for her. In addition to that, she is often forced to help clean the house by herself, even though she has difficulty doing so. Mary is a victim of elder financial abuse as she is being coerced into signing checks; and a victim of physical and emotional abuse for being forced to clean the house. Elder abuse in New Jersey most often comes from the ones whom are trusted to take care of elderly people. 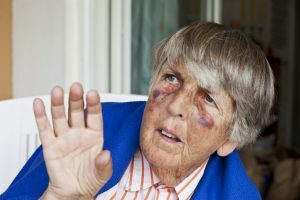 Do you recognize a victim of elder abuse? If so, it is important that this person has the right law firm representing him or her so that those who commit elderly abuse can be held responsible. If you have any questions about elder abuse and financial exploitation in New Jersey, contact me personally today. I am easy to talk to, very approachable and can offer you practical, legal ways to handle your concerns. You can reach me toll free at (855) 376-5291 or e-mail me at fniemann@hnlawfirm.com.